This panel, which entered the Thyssen-Bornemisza collection in1977 from the Italian art market, was part of a predella on the life of Saint Sabinus. Saint Sabinus conversing with Saint Benedict is the first scene, followed by three more identified ones that together form a series narrating the life of this bishop saint of Canosa di Puglia. The central painting of the altarpiece to which the predella belonged, still in its original frame, is in the Szépmu´´vészeti Múzeum in Budapest. It depicts The Virgin and Child enthroned with Angels and Saints. The original location of this fine ensemble was the chapel dedicated to Saint Sabinus in the Palazzo Petrangeli in Orvieto. The Budapest panel is dated 1473 on the pedestal of the throne on which the Virgin is seated, thus allowing for a dating of the now separated predella panels. The other episodes from the life of the saint that formed this predella are: Saint Sabinus recognising Totilla, which was in the Mario Lanfranchi collection in Rome; The Archdeacon Vindemius attemptingto poison Saint Sabinus, in the Galleria Nazionale, Urbino; and The Death of Saint Sabinus, in the Spiridon collection in Paris. 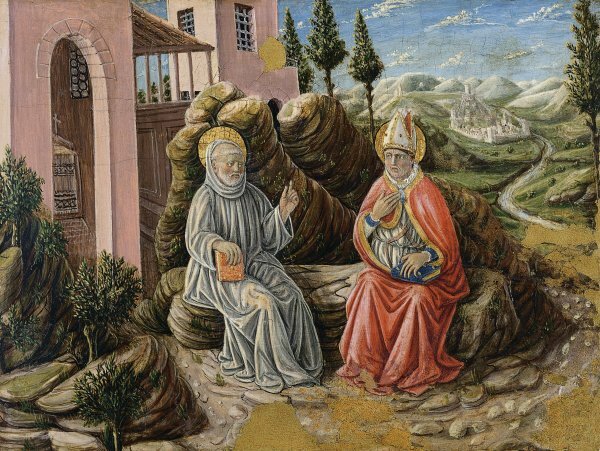 In the present panel Saint Sabinus and Saint Benedict are seated in a landscape that has been identified as Monte Cassino. They converse on the entry into Rome of the last Ostrogoth king, Totilla. In the second panel, the saint is seated at a banquet with king Totilla, whom the blind Sabinus has been able to identify through his special powers. In the third panel, an ambitious archdeacon tries to poison him with a drink but the saint emerges unharmed. On the same panel as the latter scene the artist also depicted the death of the archdeacon. The final episode is the death of Sabinus who lies on his bed blessing the crowd around him. These episodes from the life of Sabinus, who died in 556, are narrated in Saint Gregory the Great’s Dialogues. It was William George Constable who identified them and related them to the Budapest panel in 1928. Painted during the artist’s mature period, the panels reveal Boccati’s sophisticated sense of narrative and description, which is particularly evident in the figures with their expressive gestural language, as well as in the treatment of the landscape with its luminous colours.Various experts have seen these features as indicating the influence of Benozzo Gozzoli. Boccati uses the architecture as a mere background that frames the scene, depicting a conventional building set on the rocky outcrops and painted in tones of pink, inside of which is a chapel on the left, followed by a loggia and the base of a tower. Boccati uses a clear, bright light that bathes the mountains and the walled city on the right.